This spotlight examines the foreign born from Asia. It is the third in a series on the size and characteristics of the foreign-born population in the United States by country of birth. Immigration from Asia has increased considerably since the 1965 U.S. Immigration and Nationality Act. In 1960, the Asian born accounted for just five percent of the foreign-born population in the U.S., while in 2000 they made up over a quarter of those born outside the United States. Today, the Asian born are the country's second largest foreign-born population by world region of birth behind those from Latin America. As a group, the foreign born from Asian countries are more likely to be proficient in English, work in higher-level occupations, and have higher earnings than the overall foreign-born population. However, closer examination of this population reveals a great deal of variation by country of birth. The series draws primarily from Census 2000 data, including social, economic, and housing profiles of the foreign born developed by the U.S. Census Bureau. The Asian born accounted for more than a quarter of the total U.S. foreign-born population in 2000. The number of Asian-born individuals in the United States increased 65.2 percent between 1990 and 2000. Immigrants born in Southeastern and Eastern Asian countries accounted for most of the increase in the numbers of the Asian-born population between 1960 and 2000. 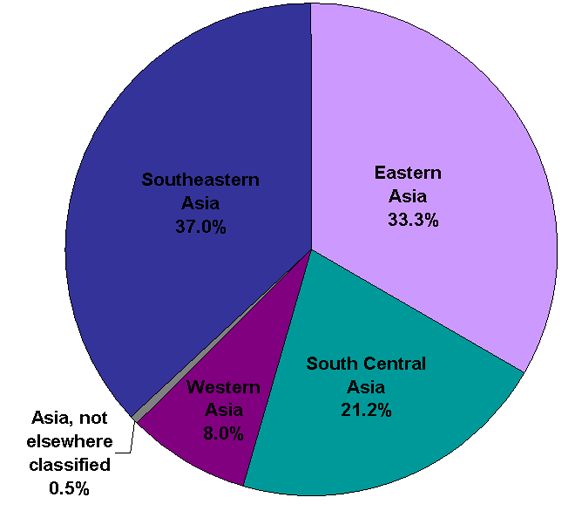 Southeastern Asians made up the largest proportion of the Asian born, followed by those from Eastern, South Central, and Western Asia. Of the Asian born living in the United States in 2000, three in four arrived after 1980. India, China, and the Philippines accounted for the largest number of arrivals between 1990 and 2000. The Asian-born groups with the largest percentage of recent migrants were from Mongolia, Oman, and the United Arab Emirates. The Asian born were more likely to be citizens than the foreign-born population in general. The Asian born tended to be older than the foreign born generally. Over half of the Asian born were women. Nine of every 10 Asian born spoke a language other than English at home. Just under half of the Asian born who spoke a language other than English at home spoke English "very well." Nearly four in every five Asian born had a high school or higher degree. More than two in every five of the Asian-born adults had a college education. The Asian born were about as likely to participate in the labor force as the overall foreign-born population. The Asian-born population was less likely to be unemployed than the foreign born in general. The Asian born were concentrated in management or professional occupations. The median earnings of Asian-born men were 34.9 percent higher than those of foreign-born men in general. The median earnings of Asian-born women were 21.1 percent higher than those of all foreign-born women. One in every seven Asian-born individuals lived in poverty in 1999. More than half of Asian-born householders owned their own home. In 2000, of the 31.1 million foreign born in the United States, 8,226,255 (26.4 percent) were born in Asian countries. Between 1990 and 2000, the number of Asian-born individuals living in the U.S. went from 4,979,038to over 8.2 million, an increase of 3,247,217 (65.2 percent). Note: The sum of the regions does not add up to total Asian-born population due to those who reported an unclassified category. Data may not be directly comparable between years due to changes in the Census Bureau’s classification scheme. Numbers for South Central and Western Asia in 2000 include countries formed from areas that were part of the Soviet Union, which were previously classified as European. Source: U.S. Census Bureau, Census 2000 and Gibson, Campbell and Emily Lennon, U.S. Census Bureau, Working Paper No. 29, "Historical Census Statistics on the Foreign-Born Population in the United States: 1850 to 1990". Figure 1 (above) indicates that the bulk of the increase of Asian-born individuals occurred after 1970, particularly among those from Southeastern and Eastern Asian countries (see sidebar for definitions). Although partly due to the addition of former Soivet Union (FSU) countries that were previously classified as European, the number of people from South Central Asia also increased dramatically, with the largest increase happening between 1990 and 2000. The increase in the number of foreign born from Western Asia was more gradual but steady. Eastern Asia includes China, Hong Kong, Japan, Korea, South Korea, North Korea, Macau, Mongolia, Paracel Islands, and Taiwan. South Central Asia includes Afghanistan, Bangladesh, Bhutan, India, Iran, Kazakhstan, Kyrgyzstan, Maldives, Nepal, Pakistan, Sri Lanka, Tajikistan, Turkmenistan, and Uzbekistan. Southeastern Asia includes Brunei, Myanmar (Burma), Cambodia, Indonesia, Laos, Malaysia, Philippines, Singapore, Thailand, and Vietnam. Western Asia includes Armenia, Azerbaijan, Georgia, Bahrain, Cyprus, Iraq, Israel, Jordan, Kuwait, Lebanon, Oman, Qatar, Saudi Arabia, Syria, Turkey, the United Arab Emirates, and Yemen. Note: Regions are defined by the U.S. Census Bureau. Southeastern Asians (3,044,288) accounted for 37 percent of the overall Asian-born population in 2000. The main sending countries from this region were the Philippines (1,369,070), Vietnam (988,174), and Laos (204,284). People form Eastern Asian countries (2,739,510) made up 33.3 percent of the Asian-born population. Those born in China (1,192,437) accounted for largest number of foreign born from this region, followed by Korea (864,125), Japan (347,539), and Taiwan (326,215). Individuals born in South Central Asian countries (1,745,201) accounted for 21.2 percent of the Asian-born population. India (1,022,552) contributed by far the largest group from this region, followed by Iran (283,226) and Pakistan (223,477). Western Asians (658,603) made up eight percent of the foreign-born population from Asia. The main countries of origin were Israel (109,719), Lebanon (105,910), and Iraq (89,892). Among the Asian born, 42.9 percent arrived between 1990 and 2000, 31.7 percent arrived between 1980 and 1989, and 25.4 percent arrived before 1980. The Asian-born groups with the largest numbers who entered between 1990 and 2000 were from India (562,320), China (556,480), and the Philippines (483,360). The Asian-born groups with the largest percentage of their own populations arriving between 1990 and 2000 were from Mongolia (93.9 percent), Oman (83.3 percent), and the United Arab Emirates (88.5 percent), which together accounted for 8,885 new arrivals in this time period. Just more than half (4,179,035) or 50.8 percent of the Asian born were naturalized U.S. citizens, compared with about 40 percent (12.5 million) of the total foreign-born population. The Asian-born groups most likely to be naturalized were from Lebanon (67.7 percent), Macau (64.1 percent), and the Philippines (61.7 percent). Conversely, the Asian-born groups with the lowest naturalization rates were from Mongolia (10.7 percent), Nepal (13.6 percent), and the United Arab Emirates (17.9 percent). The median age of the total Asian-born population (38.7 years old) was slightly older than the foreign born generally (37 years old). The oldest Asian-born groups were from Macau (44.4 years old), Cyprus (43.6 years old), and Iran (43.5 years old). The youngest Asian-born groups were from the United Arab Emirates (20.2 years old), Oman (21.7 years old), and Saudi Arabia (22.3 years old). About 52.2 percent of the Asian born were women, compared with 50.2 percent of the foreign-born population in general. The groups with the highest percentage of women were born in Japan (63.9 percent), the Philippines (58.0 percent), Thailand (58.0 percent), and Korea (57.7 percent). The groups with the highest percentage of men were born in Qatar (68.9 percent), Yemen (68.5 percent), and the United Arab Emirates (66.8 percent). About 7,376,365 (90.7 percent) of the Asian born age 5 and older spoke a language other than English at home, compared with about 83 percent of the overall foreign-born population. The groups with the highest percentages were from Uzbekistan (97.5 percent), Tajikistan (97.3 percent), Azerbaijan (97.0 percent), and Armenia (96.9). The groups least likely to speak a language other than English were from Singapore (70.9 percent), Bahrain (73.5 percent), and Sri Lanka (80.2 percent). Of the Asian born age 5 and older who spoke a language other than English at home, 46.6 percent reported speaking English "very well" compared with 38.5 percent of the overall foreign-born population. The groups most likely to speak English "very well" were born in Bahrain (79.7 percent), Kuwait (74.1 percent), Singapore (72.9 percent), and Sri Lanka (72.3 percent). Conversely, the Asian-born groups least likely to speak English "very well" were from Kyrgyzstan (23.9 percent), Vietnam (26.7 percent), Mongolia (29.4 percent), and Cambodia (29.5 percent). Of the Asian-born population age 25 and older, 78.9 percent reported having a high school or higher degree compared with 61.8 percent of the total foreign-born population. Those born in Mongolia (94.8 percent), Kuwait (94.7 percent), the United Arab Emirates (94.5 percent), and Qatar (94.3 percent) were most likely to report having a high school degree or higher. Those born in Laos (48.1 percent), Cambodia (48.4 percent), and Yemen (49.9 percent) were the least likely to report having completed a high school education. Of the Asian-born population age 25 and older, 43.1 percent had a bachelor’s degree or higher, compared with 24 percent of the overall foreign-born population. Those born in India (69.1 percent), Taiwan (66.6 percent), and Qatar (64.6 percent) were the most likely to report having a bachelor’s degree or higher. Those born in Laos (8.3 percent), Cambodia (10.3 percent), and Yemen (12.6 percent) were least likely to report having a bachelor’s degree. Among the Asian born age 16 and older, 62.7 percent (2,834,750) participated in the civilian labor force, compared with 60.5 percent (17.2 million) of the total foreign born. The Asian-born groups who were most likely to be in the labor force were from Sri Lanka (72.4 percent), Malaysia (69.3 percent), India (69.2 percent), and Nepal (69.1 percent). The Asian born least likely to participate in the labor force were from the United Arab Emirates (33.3 percent), Saudi Arabia (40.2 percent), and Oman (40.7 percent). Of the population age 16 and older in the civilian labor force in 2000, 4.7 percent of the Asian born reported they were unemployed, compared with 6.8 percent of the overall foreign-born population. The Asian born groups most likely to be unemployed were born in the United Arab Emirates (14.0 percent), Armenia (10.7 percent), and Kyrgyzstan (10.2 percent). The Asian-born groups least likely to be unemployed were form Oman (1.1 percent), Taiwan (3.6 percent), and Japan (3.7 percent). Of the employed population age 16 and older in the civilian labor force, the Asian born were much more likely than the foreign born in general to work in management and professional occupations and slightly more likely to be employed in sales and office occupations. Additionally, the Asian born were less likely to work in service, production, transportation, material moving, construction, and maintenance occupations than the foreign born in general (see table below for detailed tabulations). Among full-time, year-round workers in 1999, the median earnings of Asian-born males ($40,481) were 34.9 percent higher than the median reported for all foreign-born males ($30,000). The Asian-born males with the highest in median earnings were from Taiwan ($60,367), India ($56,645), and Japan ($53,865). Those with the lowest median earnings were from Oman ($22,312), Mongolia ($26,016), and Yemen ($26,179). The median earnings of Asian-born women ($30,289) were 21.1 percent higher than those for all foreign-born women ($25,000). The Asian-born women with the highest median earnings were from Qatar ($50,417), Oman ($45,139), Macau ($40,399), and Taiwan ($40,276). Asian-born women with the lowest median earnings were from Kyrgyzstan ($19,286), Mongolia ($19,338), Laos ($21,782), and Bangladesh ($21,822). Of the people for whom poverty status was determined in 1999, Asian-born individuals (13.8 percent) were less likely to be in poverty than the overall foreign-born population (17.9 percent). The Asian-born groups with the lowest poverty rates were from the Philippines (6.0 percent), India (8.4 percent), and Myanmar (10.0 percent). The Asian-born groups with the highest poverty rates were from Mongolia (43.2 percent), Kyrgyzstan (38.7 percent), and Saudi Arabia (36.7 percent). In 2000, 51.4 percent of Asian-born householders owned their homes, compared with 49.9 percent of all foreign-born householders. The Asian-born householders most likely to own their homes were from Macau (70.3 percent), Cyprus (65.4 percent), and Taiwan (65.4 percent). The Asian-born householders most likely to rent their homes were from Mongolia (93.4 percent), the United Arab Emirates (91.3 percent), and Oman (88.5 percent). Notes: For information on sampling error, nonsampling error, and definitions (labor force, occupations, and poverty), click here. Gibson, Campbell and Emily Lennon (1999). "Working Paper No. 29: Historical Census Statistics on the Foreign-Born Population of the United States: 1850 to 1990." U.S. Government Printing Office; Washington, DC. U.S. Census Bureau, Census 2000. "Population and Housing and Census."